During the initial weeks following the Normandy invasion and breakout of Operation Cobra in July, the M4 and M4A1 Shermans were the main battle tanks for the American forces. Tamiya's M4 Sherman appeared in 1995. 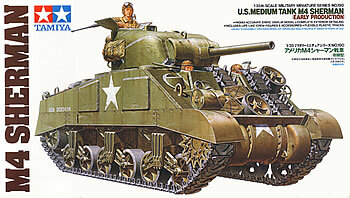 The kit is mistakenly described by Tamiya as an "early production" Sherman. And because it was based on the earlier M4A3 kit, it lacks some of the distinct features of the early M4, most notably with regard to the suspension. This is further confused by the transitory nature of components on this particular model  as new features or improvements were made to the Sherman, they were often introduced in the middle of production. Some tanks rolled off the assembly line with the new components, and if the line ran out of the new fittings, they continued production with what was on hand. Consequently, this M4 is one of those tanks where it is best to have a good source photo from which you do your research and make your choices on what options to follow. As it stands, the Tamiya hit most accurately represents a remanufactured early M4 (using the nice three-piece bolted transmission cover), or a mid-production version (with the cast transmission). Because of its origin, the kit carries forward several problems of the M4A3 (open sponsons, recessed hull welds, molded-on handles, etc. ), and adds a few quirks of its own. This kit has some notable features, including a radio for the turret, breach details for the gun, periscope covers that can be opened or closed, early three-piece transmission housing, improved split-hatch cupola for the commander, and a load of accessories and spare parts. The rubberband tracks got good reviews for their detail and eash of assembly (the ends glue together, rather than needing a heated screwdriver like the M4A3 tracks). Please refer to the M4A3 tweaks and tips article to rectify the legacy corrections. Below is a guide to building the M4. Steve Zaloga's series of books on the Sherman for Concord Publications is a good resource for photo examples. Wheels and idlers The kit comes with new spoked wheels, but has the M4A3 solid idler. That's not a problem, however, as many photos show this combination, as well as solid wheels with spoked idlers. Unfortunately, the solid idler from the M4A3 kit is hollow on the interior side and should be filled or replaced with a Verlinden idler. The kit-supplied suspension, with the raised return roller arm, was a late introduction that appeared did not appear on factory M4's, but was used on remanufactured M4's. Transmission housing Use either the late type cast cover, or the earlier three-piece housing; tanks were stripped down and reassembled randomly, so either feature is possible. Add bolts to the side of the hull where it meets the transmission cover. Sand shields Rarely seen in the field, but it's an interesting look if you want to take that option. The Tamiya kit has a narrow strip along the hull's bottom edge that suggests a mounting strip. If you don't use the sand shields, remove this too-narrow strip and use plastic or p/e to create the attachment points where the shields would be bolted to the hull. Weld seams Weld seams around the hull are recessed, and "should" be flush or ever so slightly raised. Appliqué armor plates Added to remanufactured M4's for extra protection to the turret and ammo stowage areas. Culin hedgerow cutter These were added to M4's for the Cobra breakout; several different styles are available from TRAKZ at VLS. Fuel filler caps These are missing handles, which can be made out of wire. Front hull hatches Add missing hatch springs; these did not appear on the early vehicle, but were added to the intermediate hull. Casting numbers Add to turret and hull. Square antenna mount The square mount behind the tank commander's hatch is raised, but should be recessed (as on the Italeri 75mm turret). Missing early style horn The kit comes with a later version of the horn. The early horn was a conical shape, positioned on the left fender on the early M4, and on the glacis slightly off-center on remanufactured vehicles. You'll have to scrounge one from Tamiya's Lee or Grant kits, or scratchbuild your own replacement. Remember to add cable. Transmission cover Use three-piece transmission cover. Suspension The early M4 used the horizontal return rollers. The Academy M10 or M12 are good sources. The AFV Club VVSS set takes some work to fit the Tamiya hull. Tank Workshop also makes a set in resin. Turret details Fill in smoke mortar hole; omit spotlight and mount. Periscope guards Do not use guards that may come with photoetch kits, early Sherman did not have them. Sand shield strip Remove molded-on strip and scratchbuild under-sponson clips (Hunnicutt book, pages 200-201). Sherman Detail Set (CD2001) - Generic photoetch details. M4 Sherman (35351) - Updated photoetch set. T51 Rubber Block Individual Link Track Set (RH01) - Link-to-link rubber block tracks, a good option if you want to portray a blown track situation. M4 Early Sherman Interior (1244) - nice interior for the M4, which has distinct differences from the M4A1 and M4A3.